Size: Shoulder Lunch Bags：7.48"(L)x3.14"(W)x9.84"(H);Type:1-2 Persons. 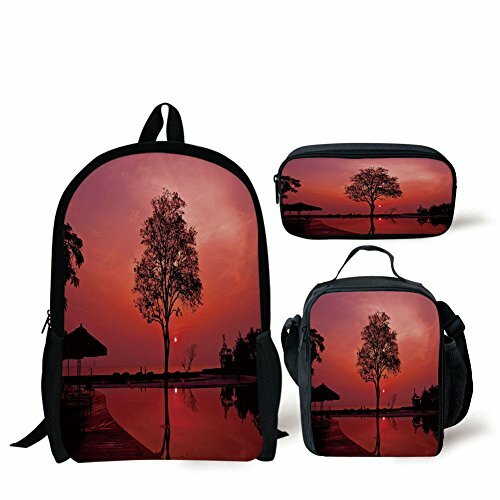 16 Inch School Backpack：17.3"L x 11"H x 5.1"W.
Children School Backpack：Made of polyester. Polyester is the popular and ideal lightweight material for ultra-strong and heavy duty backpacks. Lunch Bags：Polyester fabric keeps food hot / cold; fabric: Eva + PE cotton. Children School Backpack:With adjustable shoulder straps. Lunch Bags：With carry adjustable shoulder strap. If You Have Any Problems, Please Email Us Firstly About Your Concerns. We Commit to Offer you the Best Product and Service! Thanks! Size:Shoulder Lunch Bags:7.48"(L)x3.14"(W)x9.84"(H);Type:1-2 Persons. 16 Inch School Backpack：17.3"L x 11"H x 5.1"W.
Features:Backpack:1 main zipper compartment with two side pockets;Zipper closure. Lunch bag: 1 double zipped compartment with 1 mesh side pocket and an utensils strap inside；Zipper closure. Functions:Vivid design is suitable for schools, tourism, hiking, sports, and environmental friendly lifestyle. Notes:Please allow little color difference due to different camera or light environment.